1-CD DigiPac with 80-page booklet, 36 tracks; playing time 87:16 mns. Scarlet Ribbons (For Her Hair), The Old Lamplighter and Send Me The Pillow You Dream On. Superb fidelity from the original Fabor and RCA Victor session masters. Extensive liner notes with contributions from Maxine, Jim Ed and Bonnie Brown. The Three Bells suddenly catapulted a struggling country trio from Arkansas into pop stardom. The Browns - Jim Ed, Maxine and Bonnie - followed that success with a string of crossover hits that secured their place in popular music history. Their international following included the Beatles, who once cited them as among their favorite American singers. A half-century later, the soft, gentle harmonies of the Browns remain fresh and timeless. 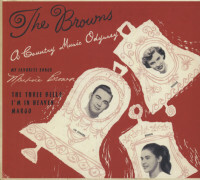 To celebrate the anniversary of trio's breakthrough with The Three Bells, Bear Family asked Maxine Brown to select the tracks that rank among her personal favorites. All the big hits are here. Many others should have been hits, but weren't. 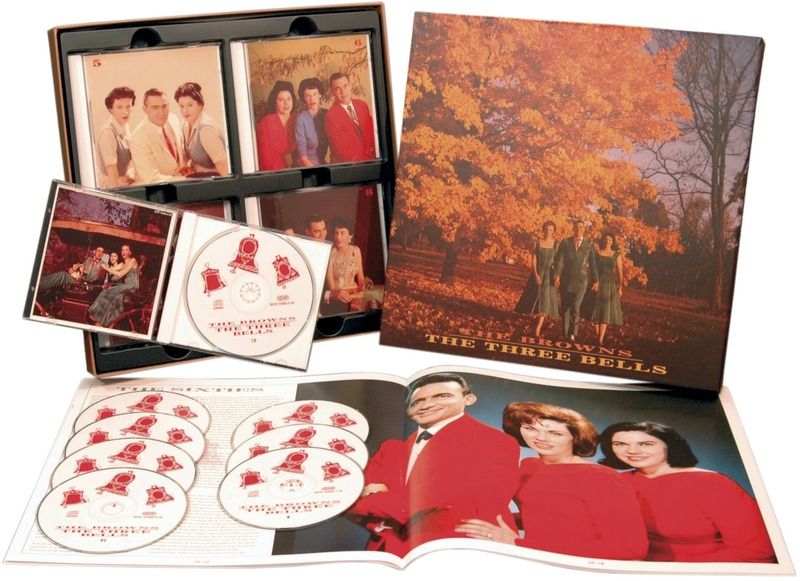 This set also includes fan favorites from the trio's earliest years, along with two enduring Jim Ed and Maxine duets: Looking Back To See and I Heard The Bluebirds Sing. Four songs from the Browns' February 1967 sessions await rediscovery. Efficiently produced by Felton Jarvis, they capture the trio at an artistic peak. But by then Jim Ed's solo career was taking off, and everyone sensed the end was near. That October a tearful Bonnie Brown formally announced the Browns' retirement to a stunned Grand Ole Opry audience. Since then other country acts tried to reproduce the Browns' signature sound. Some made admirable attempts, but not one came close to capturing the Browns' special magic. Working with Maxine, Jim Ed and Bonnie Brown, Dave Samuelson wrote new notes for this release, highlighting the professional and personal struggles that lay behind those sweet, matchless harmonies. In a side note, Dave Samuelson uncovers the intriguing wartime genesis of The Three Bells. The first song on this CD is as it should be ...'Number One.' July 3rd, 2009 is the 50th anniversary of The Three Bells. The Browns owe 50 years of gratitude to our loyal fans around the world for keeping this song #1 in their hearts. With help like this, perhaps the song itself will survive another 50. On June 1st, 1959, when we went into the Studio in Nashville to record The Three Bells, we never dreamed we'd still be hearing it on radio stations everywhere fifty years later. And not just the country stations, but pop stations, too. After the session was over that night, our A&R Director, Chet Atkins, told us he thought we had a hit. We never dreamed it would be such a big hit, however. On July 3rd, the record was released and in a few short weeks we saw it become #1 in country, pop, and rhythm & blues charts. We couldn't believe it, then, and still find it hard to believe when we hear it played on radio stations. We are so appreciative to our fans and friends who still want to hear it. Although we don't get together often anymore to sing, it's always a thrill to hear the audience response to our songs from fifty years ago. My thanks to all of you. 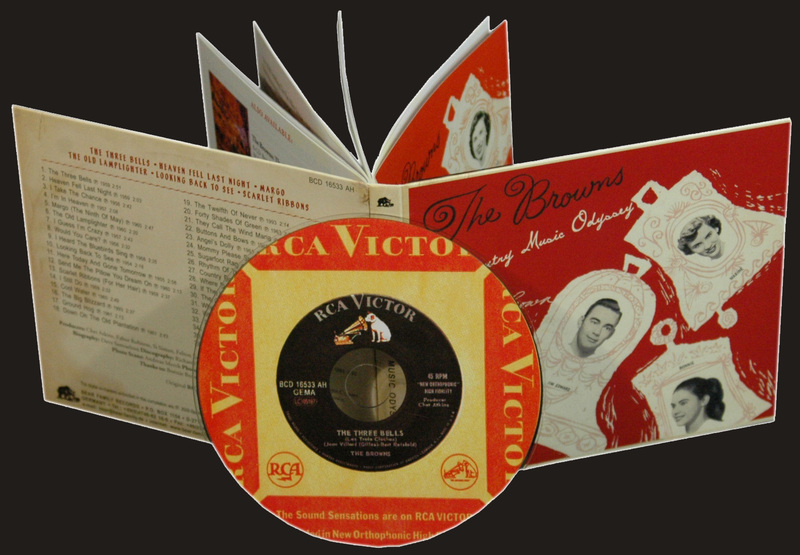 For many years, Jim Ed and the Browns have enjoyed a great relationship with RCA Victor Records and our thanks and gratitude are extended to all of our friends there. Bear Family has now released a new compilation of some of our most requested songs. I love to listen to each and every one of them. Hopefully, now that you have this set, you'll enjoy them as much as I still do. During the October 1967 Disc Jockey Convention, a tearful Bonnie Brown stunned the Grand Ole Opry audience when she announced the retirement of the Browns, formally ending the twelve-year professional partnership of Maxine, Jim Ed and Bonnie Brown – not counting those years her older siblings worked as a duet. For those in the know, the news was hardly unexpected. 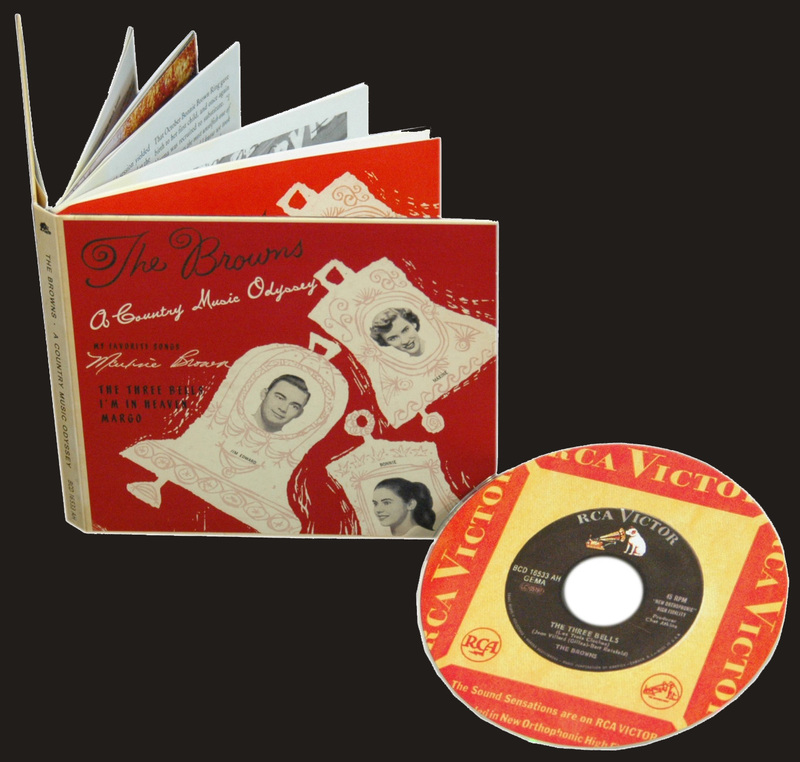 During the past two years RCA Victor successfully launched Jim Ed Brown as a soloist. His career-making hit Pop A Top just completed a 20-week run on 'Billboard's' country charts, peaking at #3. In truth, Bonnie was already semi-retired. When the Grand Ole Opry added the Browns to its roster in June 1963, she opted to remain with her physician husband and two young children in Dardanelle, Arkansas, while Jim Ed and Maxine moved to Nashville. For Opry appearances and road dates Maxine and Jim Ed worked as a duo or recruited other singers to replace her. Relatively few knew the real story behind the trio's decision. 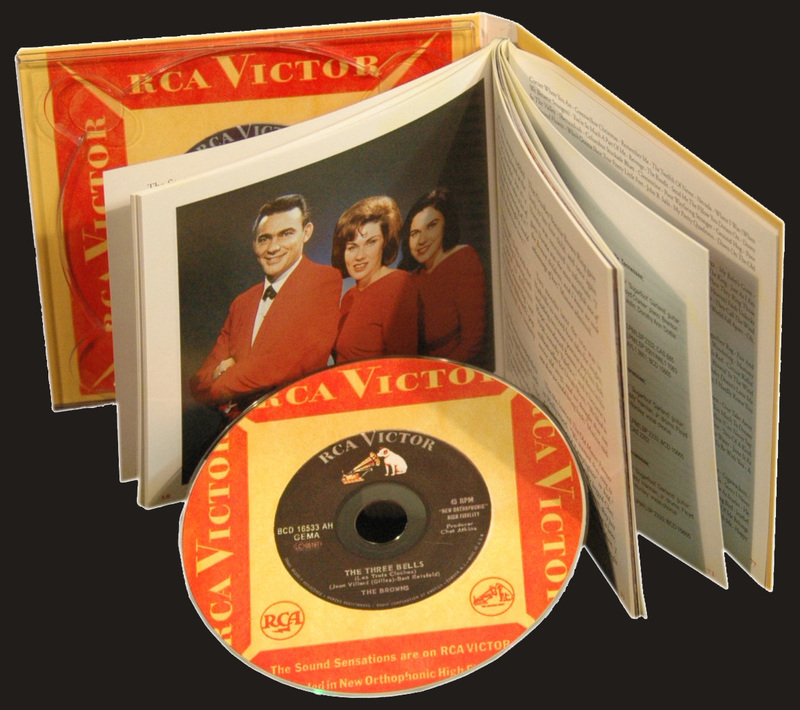 The Browns had long been at odds with RCA Victor, primarily over its commercial direction. Seven years earlier the trio built an international following with its groundbreaking crossover singles The Three Bells, Scarlet Ribbons and The Old Lamplighter. Division Vice President of Popular Artists and Repertoire Steve Sholes expected them to cater to mainstream pop audiences: a choreographed nightclub act with snappy patter, lush orchestral arrangements and pricey formal wear. But at heart, the Browns longed to sing for appreciative rural audiences, backed by Jim Ed's guitar and perhaps a few other musicians. Producer Chet Atkins knew the Browns for what they really were: a close-harmony country trio – probably the best that ever was. But Atkins' vision of the Browns put him in direct conflict with Sholes and RCA's New York corporate office. Trying to strike a balance led to uncomfortable studio compromises that alienated country deejays who dismissed the Browns as too 'pop' and urban radio programmers who considered them too country. Fewer still knew that Bonnie's on-stage announcement actually marked the third time the Browns decided to call it quits. The first time was in 1955, when the trio was locked into an exploitive, ironclad contract with Fabor Robison, one of the music industry's most despised producers and promoters. The second time came four years later, when all three members wondered if the small financial rewards really justified all those years on the road. Despite a roomful of awards from industry trades, they watched their record sales dwindle as rock 'n' roll dominated the airwaves. And then there were family matters. Maxine was pregnant with her second child. Their mother Birdie suffered a stroke and needed help running her successful restaurant and club back in Pine Bluff, Arkansas. Their handicapped father needed help running his sawmill, a chore Jim Ed always assumed when he wasn't touring. Of course, The Three Bells changed all that. But in October 1967, nobody wanted the Browns go their separate ways. Few harmony groups in American music were as beloved as Jim Ed, Maxine and Bonnie Brown from Pine Bluff, Arkansas. If their saga was laced with frustration, disappointment and heartbreak, the music they made still endures. This Bear Family collection commemorates the fiftieth anniversary of The Three Bells. 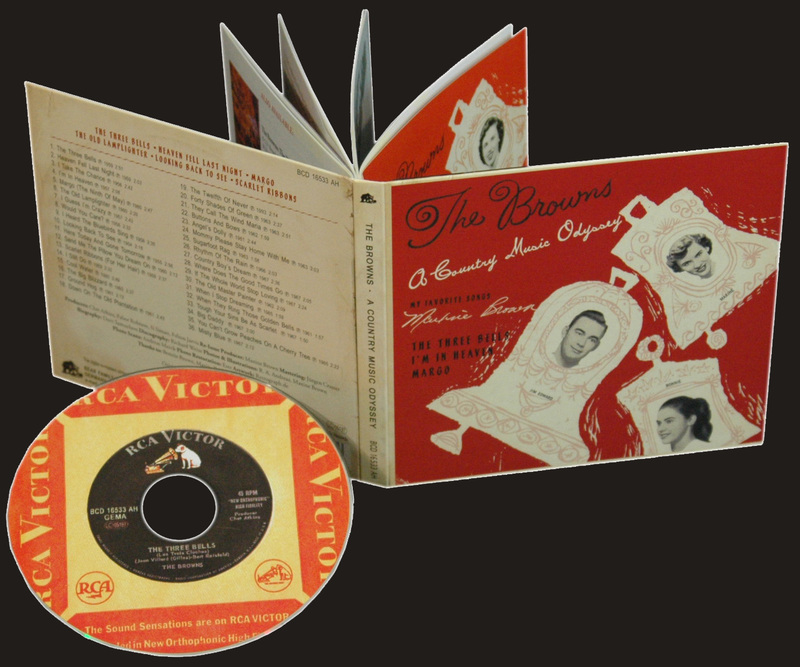 Some tracks here are longtime fan favorites, but most are musical benchmarks Maxine Brown Russell selected from the Browns' decade-long tenure with RCA Victor. The Browns' story begins August 11, 1930, when Floyd Brown, a poor southwest Arkansas farmer, married Birdie Lee Tuberville in Holly Springs, Arkansas, a backwater community not far from Sparkman. From the start, music was an important thread in the Brown family. Floyd's brother Wilburn played fiddle at local dances and social gatherings, usually with Floyd and another brother, Cecil, accompanying on guitars. With farming jobs scarce around home, the newlyweds moved to Campi, Louisiana, in 1930. Their first child, Ella Maxine, was born there on April 27, 1931. Later that year the family returned to Arkansas, settling in Sparkman's timber-rich hills. Floyd hoped to land a sawmill job, but the Depression all but wiped out demand for local lumber. He supported his wife and daughter by farming, hunting and trapping. Eventually, a mill offered him steady work as a truck driver. During the next seven years Birdie gave birth to three more children: Jim Edward on April 1, 1934; Raymond on December 29, 1936; and Bonnie Gean on July 31, 1938. Shortly afterwards Floyd saved enough money to buy a farm in Holly Springs, although he continued to work at the sawmill. On Saturday nights the family gathered around the radio to hear the Grand Ole Opry. When Jim Ed was nine, he dreamed of becoming a singer like the ones he heard over the radio. Because a hand injury ended his father's ability to play the guitar, the boy asked his Uncle Cecil to teach him a few chords. Before long he and Maxine began acquiring 25-cent songbooks from radio singers and recruited six-year-old Raymond to harmonize with them. However, that budding trio was short-lived; Raymond was killed in a freak truck accident on Labor Day, 1943. Customer evaluation for "A Country Music Odyssey"